“This Caribbean-style soft drink uses a “ginger bug” to start the fermentation. I got this idea from Sally Fallon’s Nourishing Traditions. The ginger bug is simply water, sugar, and grated ginger, which starts actively fermenting within a couple of days. This easy starter can be used as yeast in any alcohol ferment, or to start a sourdough. Start the “ginger bug”: Add 2 teaspoons (10 milliliters) grated ginger (skin and all) and 2 teaspoons (10 milliliters) sugar to 1 cup (250 milliliters) of water. Stir well and leave in a warm spot, covered with cheesecloth to allow free circulation of air while keeping flies out. Add this amount of ginger and sugar every day or two and stir, until the bug starts bubbling, in 2 days to about a week. 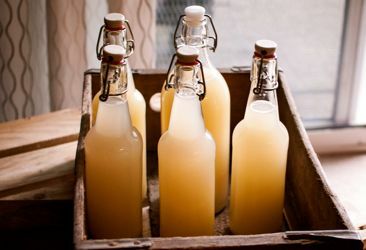 Make the ginger beer any time after the bug becomes active. (If you wait more than a couple of days, keep feeding the bug fresh ginger and sugar every 2 days.) Boil 2 quarts (2 liters) of water. Add about 2 inches (5 centimeters) of gingerroot, grated, for a mild ginger flavor (up to 6 inches/15 centimeters for an intense ginger flavor) and 11/2 cups (375 milliliters) sugar. Boil this mixture for about 15 minutes. Cool. Once the ginger-sugar-water mixture has cooled, strain the ginger out and add the juice of the lemons and the strained ginger bug. (If you intend to make this process an ongoing rhythm, reserve a few tablespoons of the active bug as a starter and replenish it with additional water, grated ginger, and sugar.) Add enough water to make 1 gallon (4 liters). Bottle in sealable bottles: Recycle plastic soda bottles with screw tops; rubber gasket “bail-top” bottles that Grolsch and some other premium beers use; sealable juice jugs; or capped beer bottles, as described in chapter 11. Leave bottles to ferment in a warm spot for about 2 weeks.